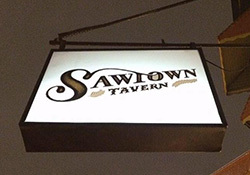 "SawTown Tavern is located on the site of the former Prince Cafe. SawTown represents a collaboration between two good friends and Tacony residents, Mike "Scoats" Scotese and Troy Everwine. Scoats is nationally known in the craft beer community and an owner of the Grey Lodge Pub and Hop Angel Brauhaus, while Troy brings decades of experience in restaurant and food service management."